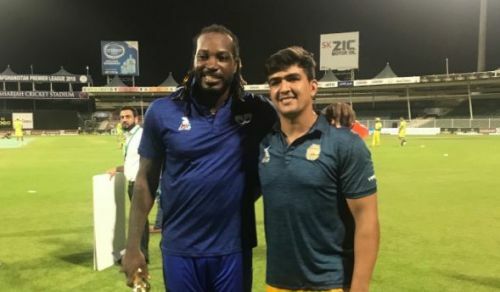 Will Chris Gayle take Balkh Legends to glory? So, after almost 16 days, 22 matches, and some exhilarating performances we are all set to witness a grand finale of APL 2018 between Balkh Legends and Kabul Zwanan. Balkh and Kabul will be locking horns for the third time in the tournament after having come up against each other in the two league games. In both the encounters between them, Balkh Legends turned out to be triumphant with a margin of eight wickets and 21 runs respectively. Both teams are in some scintillating form. Thus, the final is expected to be an absolute treat for cricket fans with some excellent performances on the cards. Balkh Legends have been splendid under the captaincy of Mohammad Nabi. After finishing the league stage as the table toppers, Legends entered the semifinal stage with a lot of confidence. They had a sparkling semifinal against Nangarhar Leopards where they smashed 235 runs in their quota of 20 overs. In reply, Leopards were bundled out for 64 and thereby handing Legends a mammoth 171-run victory. Balkh Legends' batting lineup includes the likes of Chris Gayle, Darwish Rasooli, Colin Munro and Mohammad Nabi, which makes them one of the most destructive batting lineups in the tournament. Besides, decent support from other batsmen has put Balkh right at the top in the batting department. Bowling has been equally good for Balkh Legends. Despite the lack of overseas support, they have blossomed in the bowling department. They have had some decent national capped and uncapped bowlers - one of the reasons for their success in the tournament. Mirwais Ashraf and Gulbadin Naib have been their pick of bowlers with 13 and 12 wickets in the league respectively. Thus, with batting being their forte and excellent bowling support, Balkh Legends would be looking forward to etching their name in the history while clinching the first edition of APL 2018. Probable Playing XI for Balkh Legends: Chris Gayle, Darwish Rasooli, Colin Munro, Mohammad Nabi (C), Ravi Bopara, Ryan ten Doeschate, Ikram Ali Khil (WK), Gulbadin Naib, Mirwais Ashraf, Qais Ahmad, and Aftab Alam. Kabul Zwanan have had a pretty decent tourney under the leadership of Rashid Khan who has led them from the front with some decent performances, especially with the bat. Zwanan finished the league stage on the third position and entered the semifinal with a generous amount of work to do. The team fired on the big stage as they got the better of Paktia Panthers in the semifinal. On the back of good batting performances by Colin Ingram and Rashid Khan, Kabul posted a hefty total of 192 on the board. 193 happened to be too big a target achieve for Panthers as they fell like a pack of cards. They lost the game by 90 runs. Without any doubt, Kabul Zwanan have aced their batting lineup with plenty of match-winners in their side. Barring one or two occasions, they have never had a bad day with the bat. With the likes of Hazratullah Zazai, Colin Ingram, Laurie Evans and Luke Ronchi in their arsenal, they have been a nightmare for any bowling opposition. However, their bowling has witnessed two extremes - the best and the worst. They kicked-off their campaign with a lot of inconsistency with the ball as their bowlers failed to stick to their lines and lengths. Nonetheless, while going deep into the tournament, they have attained a great deal of consistency in their bowling with one example being the semifinal. Thus, with overpowering batting lineup and pretty much decent bowling support, Kabul Zwanan will look to put down the favourites tags from Balkh Legends while unsettling them in the finals on the road to their first ever APL title. Probable Playing XI for Kabul Zwanan: Hazratullah Zazai, Luke Ronchi (WK), Colin Ingram, Javed Ahmadi, Laurie Evans, Shahidullah Kamal, Rashid Khan (C), Muslim Musa, Fareed Ahmad, Wayne Parnell, and Fitratullah Khawari. APL 2018 has been quite unpredictable when it comes to the overall performances of the team - inconsistency might be the cause. Let alone the fact, today's final becomes a lot more predictable. With immaculate batting strength and ominous bowling lineup, Balkh Legends are expected to do justice to their favourites tag and become the first ever champions of Afghanistan Premier League. Expected top performers for Balkh Legends: Chris Gayle, Darwish Rasooli and Mirwais Ashraf. Expected top performers for Kabul Zwanan: Colin Ingram, Rashid Khan and Hazratullah Zazai. Final Prediction: Although an exciting final is on the cards, Balkh Legends might just go on to lift the trophy.